Jordan Peterson is the psychology professor from the University of Toronto who has become something of a celebrity intellectual. Men’s Rights Activists and Alt Righters everywhere are absolutely happy to flock to this guy. He’s popular because he opposed a Canadian law that will supposedly destroy your career as a professor for not using gendered pronouns that go beyond two. Oddly, even though he’s opposed this law, his career is perfectly safe and he benefits greatly for his opposition to this law. Here are 5 Reasons Stoicism Is Greater than Him. 1. Jordan Peterson famously compared human beings to lobsters. As bizarre as this might sound it’s particularly pernicious. Jordan Peterson is saying that human beings have hierarchies like the lobster and that these hierarchies are not artificially created by global capitalism but just the natural order of things. Jordan Peterson is essentially saying that the terrible ways our system is is because we’re just designed that way and it’s not just that we’re designed that way but it’s good. So you should be happy being at the bottom. Stoicism just observes humans the way they are. There have been hierarchies throughout all time but they’re never exactly the same hierarchies. There used to be master-slave hierarchies, feudal hierarchies, and now we have capitalist hierarchies. Nothing is static. The Stoics knew the universe was change. The Stoics also believed everyone ultimately deserved equal status in the world of things. No one was a Sage, so everyone was in the same boat. No one was really any better than anyone else. 2. Jordan Peterson uses the theory of evolution in a way to justify his Jungian archetypal theory. Unfortunately he engages in evolutionary psychology, which most forms of it are pseudoscientific since we have no idea what were in the heads of our distant ancestors. It’s speculation at best, pseudoscience at worst. And Jordan Peterson should know better than to consider Carl Jung an important psychologist. Stoicism is always updating closely with the current science. Stoicism used techniques back in its ancient days that were a lot like Cognitive Behavioral Therapy. In fact, CBT owes quite a bit of its development to Stoicism, which is pretty much Stoic psychological techniques being tested in the lab. 3. Jordan Peterson may have won that interview with Cathy Newman on Channel 4 News but he can’t win an argument against a Stoic. Why is that? A true Stoic is adept at logic and rhetoric and knows when someone is using rhetoric as opposed to logic. Jordan Peterson is an excellent rhetorician but if challenged by an actual professional philosopher or psychologist like Massimo Pigliucci or Donald Robertson, he’d have to eat his hat. The problem is Jordan Peterson is used to being interviewed by people who don’t have expertise. But how would he do with an expert in his same field or in his crossover field: philosophy? 4. 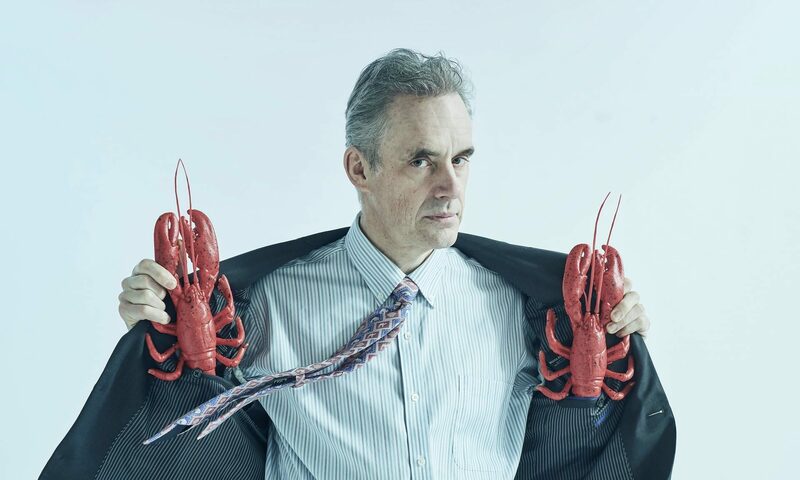 Jordan Peterson Lobster Lobster Jordan Peterson. Stoicism doesn’t use lobsters to justify its philosophy. Any questions? 5. Finally, Jordan Peterson doesn’t calm down his rabid followers. Zeno of Citium is known for reprimanding his followers whenever they became too uncontrollable. Jordan Peterson seems to make a killing out off having a fervent crowd of young pissed off white males. Stoicism has no place for any amount of fervent followers, even if a few. I published a new book on Amazon available for Kindle. There is some indication that at least a few of the ancient Stoics might’ve had polytheistic beliefs, invoked divination, and prayed to the gods. Despite this, Stoicism as a philosophical system does not hold any beliefs in the power of prayer or wishful thinking. Here are 5 reasons Stoicism is better than prayer and wishful thinking. 1. Stoicism uses reason to try to understand the world realistically and adapt to the world practically. Prayer and wishful thinking don’t look at the world from an honest perspective. Prayer and wishful thinking generally is in denial that fortune can just manifest positively or negatively at random times. Prayer and wishful thinking fundamentally believe that things can be changed for the better when there’s really no actual evidence that this can be the case. Stoicism is just more honest. 2. People waste a lot of time praying and thinking wishfully. When instead they can use Stoicism, which helps them deal with hardship and loss. Why waste so much time wanting things to be a certain way when you can just use Stoicism to adapt your mind to the way things are? 3. People trick themselves into believing in the power of prayer through confirmation bias. They remember all the times when prayer seemed to work and forget all the times when it didn’t work. Stoicism doesn’t rely on confirmation bias. What you put into Stoicism, you get out. 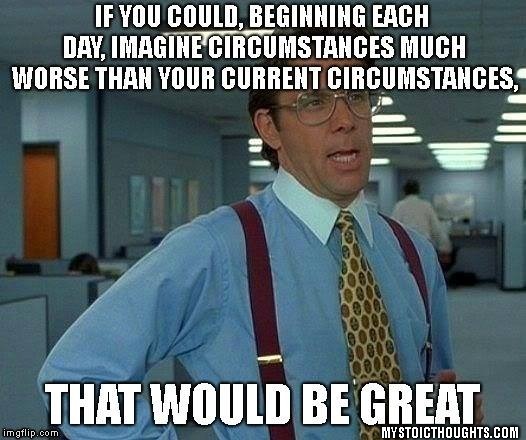 So if you’re trying to be more virtuous and work at it, you’ll become more virtuous. You just have to try. In fact, people will begin to notice how you’ve changed and maybe want to emulate you. 4. Stoicism helps you use your reason and senses to help you anticipate future events. For instance, if you get to know people realistically rather than what you wish they were, you can judge their characters easier if you’re close to them. You can tell who might be trying to scam you or exploit you and you can easily adapt to that. But if you’re using wishful thinking, you wish a person was a certain way, and so you don’t get to know them the way they really are. So then those people just use you and abuse you. 5. Finally, Stoicism helps you learn from the past and prepare for the future by living in the present. Wishful thinking and prayer just makes you live in the future or the past but never lets you learn from the present. You’re always thinking of how you wish things used to be but you’re not learning how to make things great now for yourself. Or you’re praying for a nice sports car but you’re not thinking about how nice your car is now. Toxic waste in science fiction or fantasy can do a lot of amazing things when, for one example, turtles or a rat are exposed to it like in the Teenage Mutant Ninja Turtles. It basically gives anyone super powers; well, when it’s the right toxic waste, usually it glows green. Stoicism though says the only thing truly in our power is our judgment, opinions, goals, aversions, and desires. In fact, since they’re really the only thing in anyone’s power, Stoics have become much greater masters of their rational faculties and thus have the real superpowers. In real life, toxic waste can make you really sick. Stoicism doesn’t seem to do that. Stoicism might make you practice some discomfort but generally doesn’t require you to go overboard and certainly wouldn’t make you expose yourself to toxic waste by eating it or swimming in it. Toxic waste, when not stored properly, can really harm the environment. Though ancient Stoics did not discuss the environment (that I know of), in the modern age Stoics, using their reason, would find it important to preserve or conserve natural environments and resources. 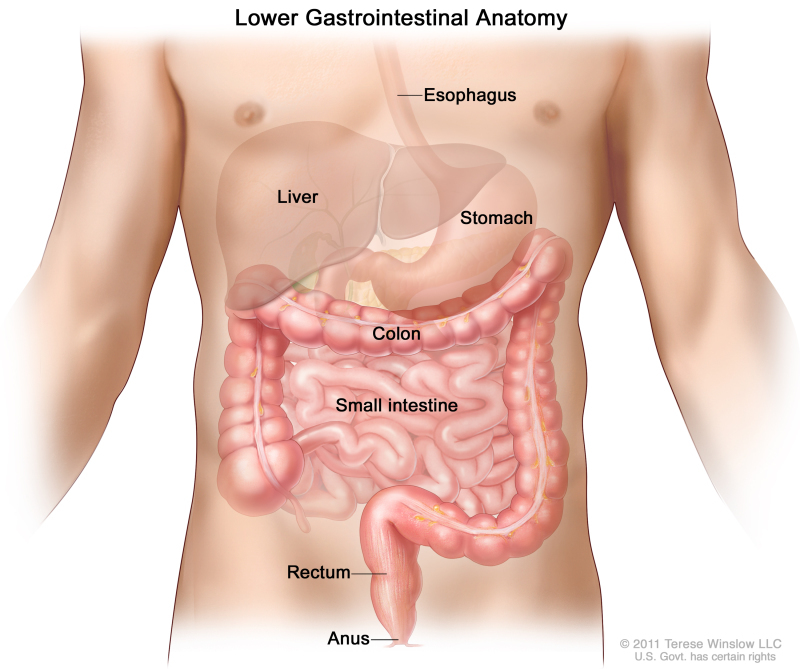 Toxic waste usually contains elements like arsenic or mercury or molecules like cyanide or PCBs. These elements and molecules can harm you if ingested or harm the environment. But if you ingest Stoicism through your mind, it tends to heal your mind and provide benefit. Also if you release Stoicism into the environment, for example, you tell a tree or a river about Epictetus, the tree doesn’t get harmed nor does the river’s aquatic wildlife. Toxic waste doesn’t feel very good. If you get it on your skin, you’ll likely feel yucky but you could also feel like your skin is on fire as the chemicals eat away your epidermis. Stoicism never seems to feel yucky or eat your skin. You can’t even really bathe in it or drink it. But you can definitely consume it. Using negative visualization wrong can have ill effects. But if you use it right, you will find a lot of benefit.